When the alarm went off at 5:15 AM—only five hours since I laid my head on a pillow, weary after a night of bad weather and delayed flights—I jumped up as if it were hours later, as if the sun might be up and I might be well-rested. Neither of those was true, but that didn’t matter. We were two hours away from cruising through the Panama Canal. I could catch up on sleep another time. 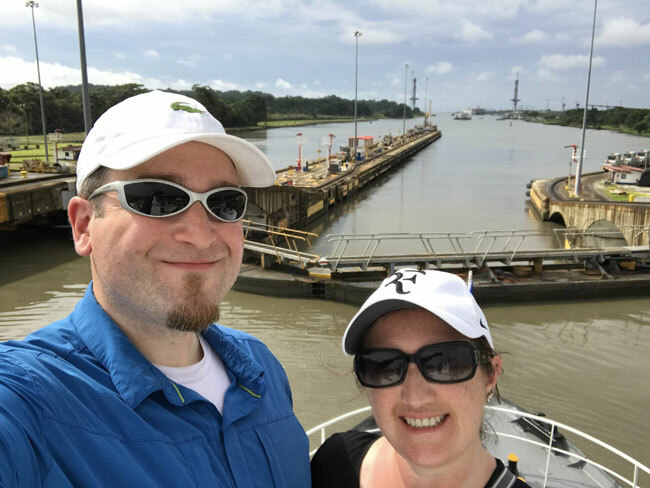 The Panama Canal attracted Adam and me because it so uniquely combines history, engineering, and Panama’s exceptional natural beauty into one singular experience. 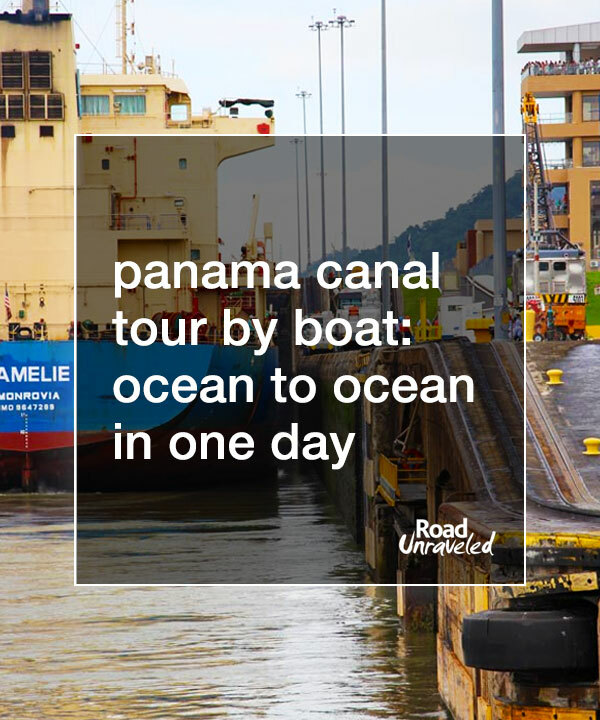 We were so excited about it that we decided to devote an entire day to it; while it’s possible to transit part of the canal in half a day, we couldn’t pass up the chance to travel through all three of its locks. 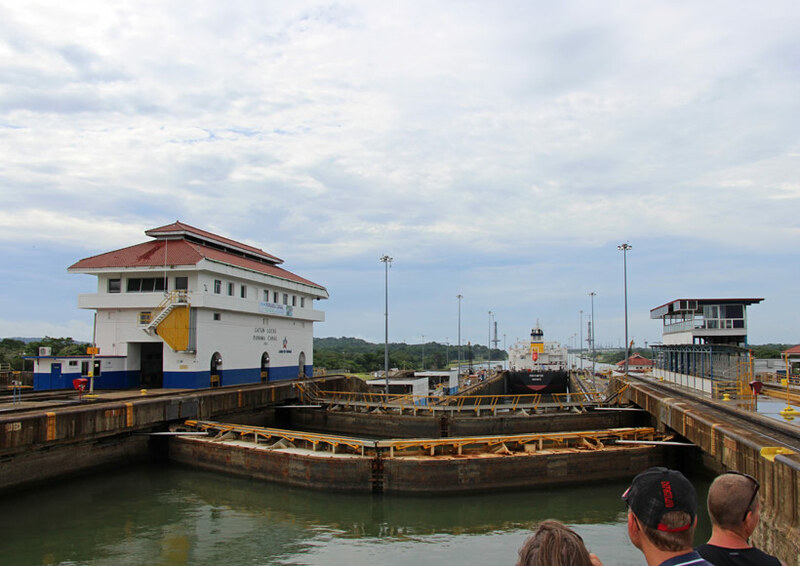 If a visit to the Panama Canal is on your list— or if you’re looking for a fun day trip from Panama City—here’s what we learned and experienced as we spent our day on the water! 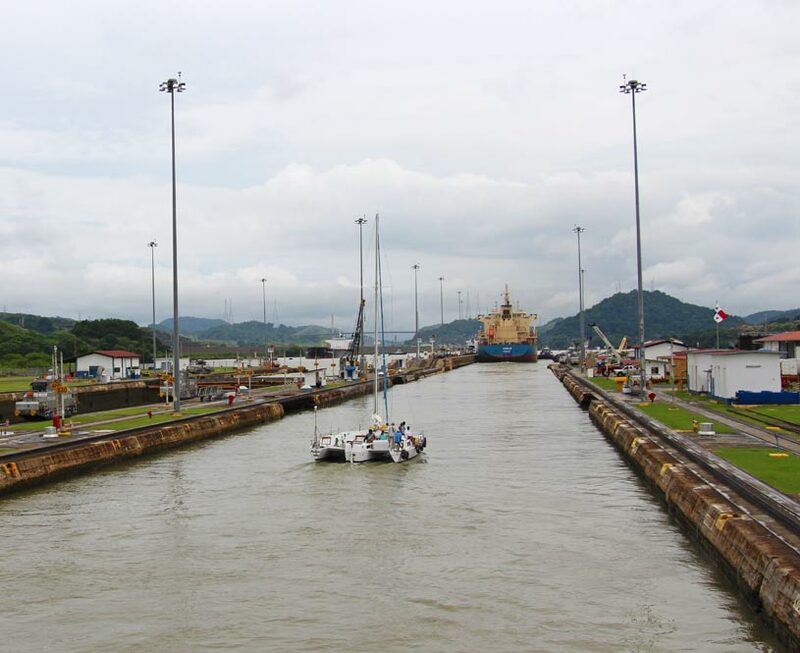 Although there were a couple of failed attempts to create a canal during the 1800s, the Panama Canal as we know it today was built by the United States between 1904 and 1914. The USA had a significant interest in building the canal and attempted to reach a deal with Colombia, who claimed Panama as a territory at the time, but Colombia’s senate did not ratify a treaty signed by its president and the USA’s President Theodore Roosevelt. This directly led to Panama’s declaration of independence in November of 1903; the USA signed (and ratified!) a new treaty with the new country shortly thereafter. 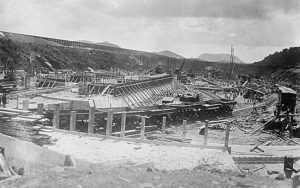 In May 1904 the USA took control of the canal development project. Designed to reduce the amount of time cargo ships took to navigate between the Atlantic and Pacific Oceans, building a canal through a country proved to be no easy task. Even beyond the actual construction, it was disease that plagued the project. More than 5,500 workers died of primarily mosquito-transmitted diseases like yellow fever and malaria, leading the US authorities to put numerous disease control and eradication measures in place. The development plans for the canal itself were messy when the United States first reviewed them. 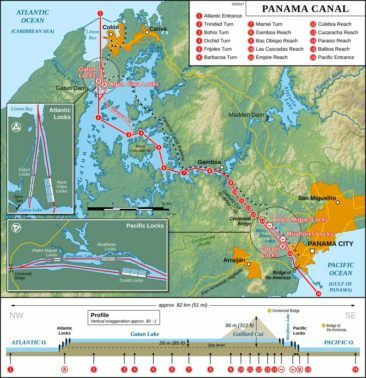 France’s prior attempt recommended building a sea-level canal across Panama, but a review commission determined that was not a feasible solution because of the amount of excavation necessary to build it. Instead, a new proposal recommended a lock system that could raise ships to a new manmade lake and then lower them back to sea level on the other side. The plans were approved and put into motion, and on August 15, 1914 the Panama Canal officially opened. 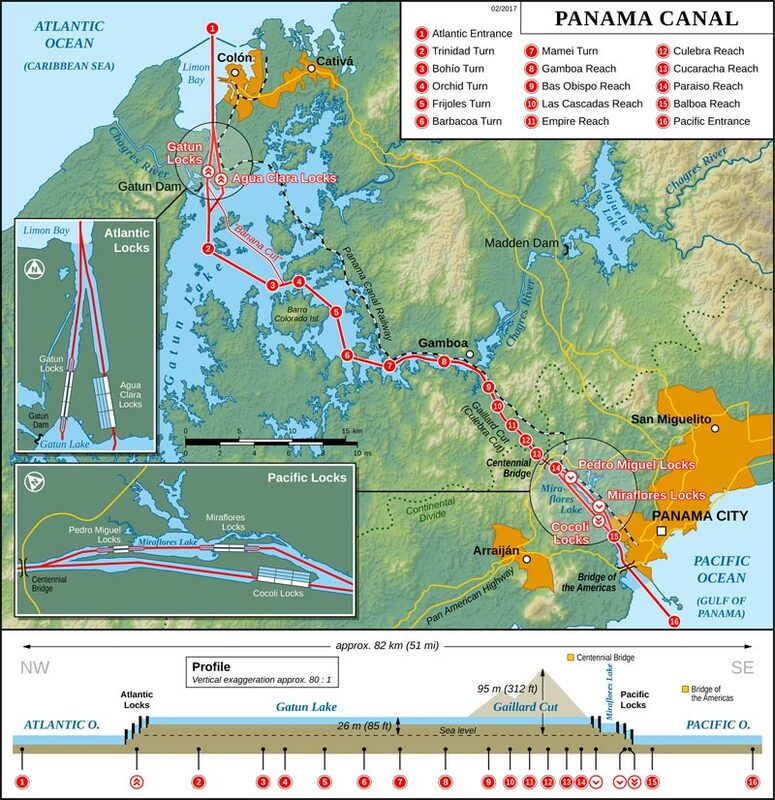 The Panama Canal is a series of watertight locks that rely on simple physics to raise ships from the ocean to 85 feet above sea level before lowering them into another ocean 48 miles away. Ships can enter from either the Atlantic or Pacific Ocean depending on the direction of their journey, and the canal is open twenty-four hours a day, seven days a week. Each lock has two lanes that are available to use. 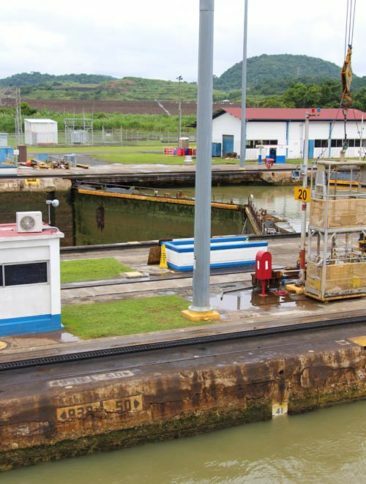 From an engineering standpoint, transiting the canal is straightforward. 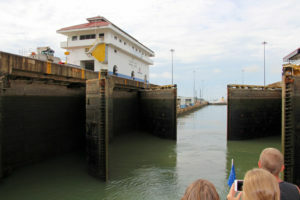 A ship enters one of the lock’s chambers, and a large lock gate closes behind it. Then, enormous valves open to let water from Lake Gatun into the lock. The locks fill up over the course of five to eight minutes, using gravity to push water inside, which causes the ship to rise up until the point that the lock is full. From there, the ship transits into a second lock chamber, where the process begins a second time. After sailing across Lake Gatun, ships enter an additional series of locks where instead of filling the chambers with water, the chambers are drained, which lowers the ship back to sea level so they can continue into the ocean. 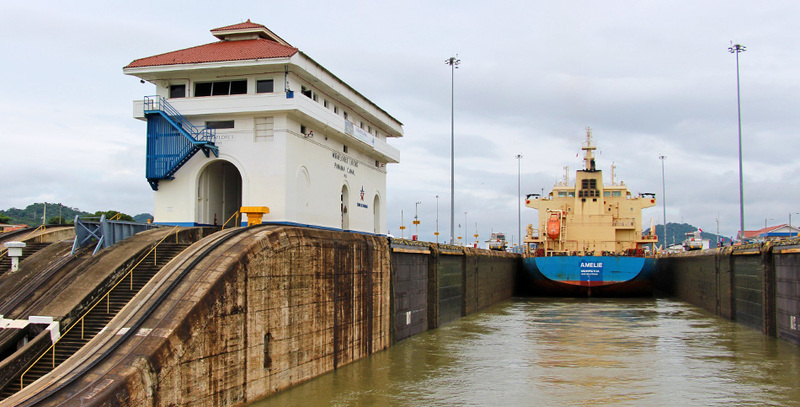 The Miraflores Locks are the closest to Panama City and the Pacific Ocean. The locks have two chambers and raise ships 54 feet up to Lake Miraflores. 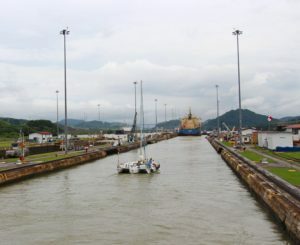 The Pedro Miguel Locks are not far from the Miraflores Locks. They have a single chamber that raises ships 31 feet to Lake Gatun. 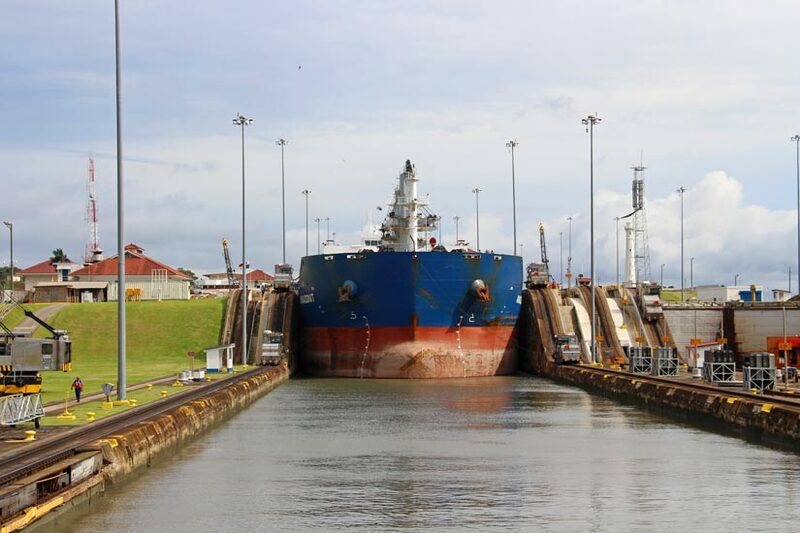 The Gatun Locks are the closest locks to the Atlantic Ocean. They have three chambers that lower ships a total of 85 feet back to sea level. 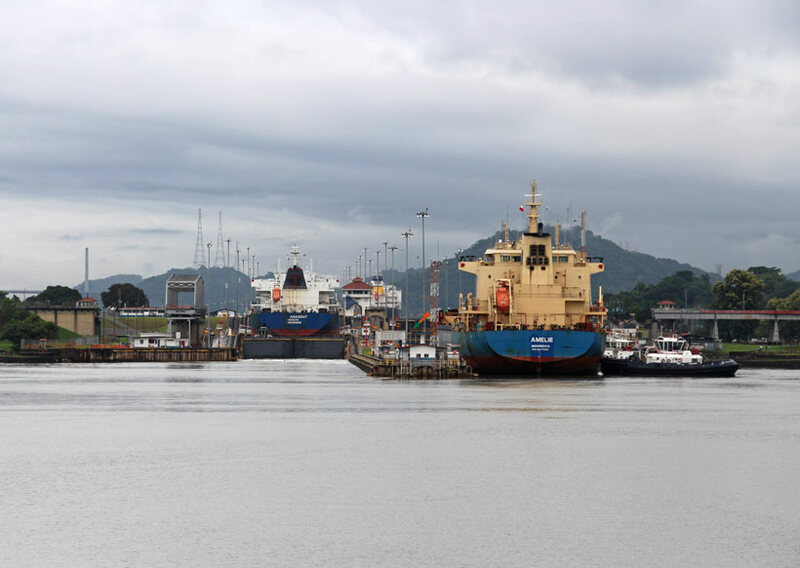 For ships that are transiting from north to south, they enter the locks in reverse order, which means the Gatun Locks raise them instead of lowering them, and the Pedro Miguel and Miraflores Locks lower them instead of raising them. It’s a tight fit for the big ships! 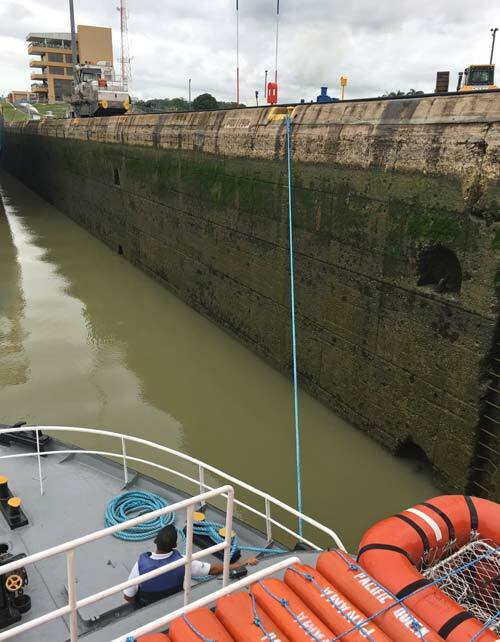 Many of the ships that pass through the locks are absolutely enormous, so it takes a huge team to ensure they pass safely without damaging the locks or their own boats. When a ship is ready to pass through the canal, a pilot from the Panama Canal Transit Authority boards the ship and is responsible for guiding it from end to end. It’s one of the few times a ship’s captain is not in control of his or her own vessel. 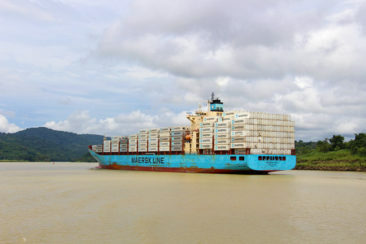 If you are on the water, it’s easy to spot when a pilot boards; a speedboat pulls up alongside a cargo ship, a gangplank is extended, and the pilot boards. Pilots are necessary for smaller ships as well; our pilot joined us without using a gangplank because of the size of our boat. When the ship is safely out of all of the locks, another speedboat appears to reclaim the pilot and take him to his next assignment. Larger boats are pushed into position by tugboats, which ensure the ships are as close to the locks’ walls as possible. These ships are then connected to electric trains called mules, which are responsible for guiding the ship along a very precise route within the lock chamber. The mules effectively have full control of the ship during this time, and they do no disconnect until the chamber is open and the boat has cleared the lock. Smaller boats that don’t run the risk of damaging the locks do not need assistance from mules, but they do tie up to the walls during filling and draining to minimize the boat’s movement. Many cargo ships are built specifically to pass through the canal’s locks, where the chambers measure 110 feet wide by 1,000 feet long. 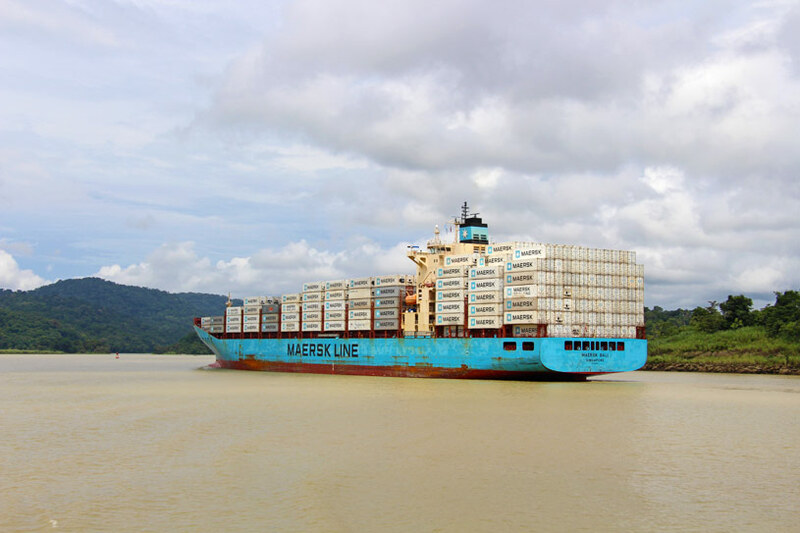 Ships that fill up the chamber are called Panamax ships because they are the largest ships that can transit through the locks. 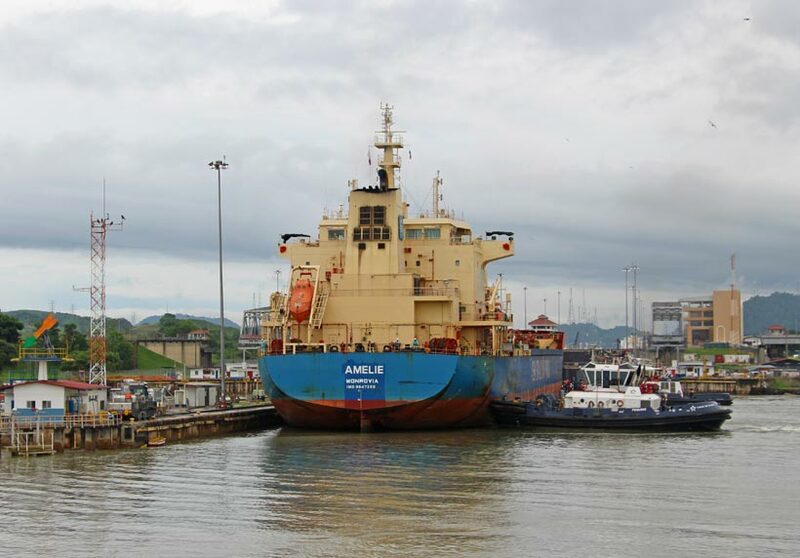 However, not every ship is a Panamax ship; it’s common for the Panama Canal Transit Authority to group smaller ships together to maximize each time a lock is open. Our ship transited with a mid-size cargo ship and a small sailboat, which tied to our ship to keep it steady when the locks filled with water. 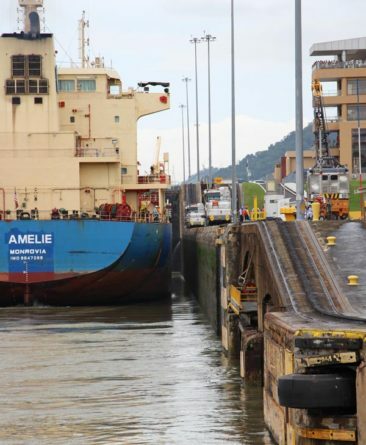 The Panama Canal averages 42 transits each day. 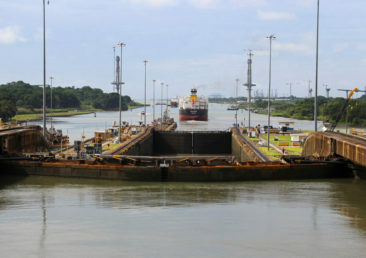 If you think that sounds low, it is—ships take between 8 and 10 hours to transit all three locks during a canal passage. 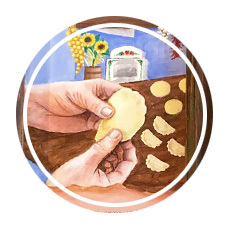 It’s a slow, meticulous process! Ships enter on a first-come, first-served basis. 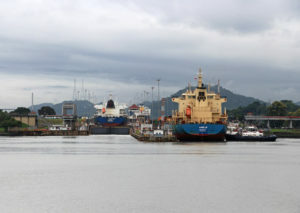 Many ships wait for approximately 24 hours in line, queuing in either Panama City or Colon, before their transit begins. 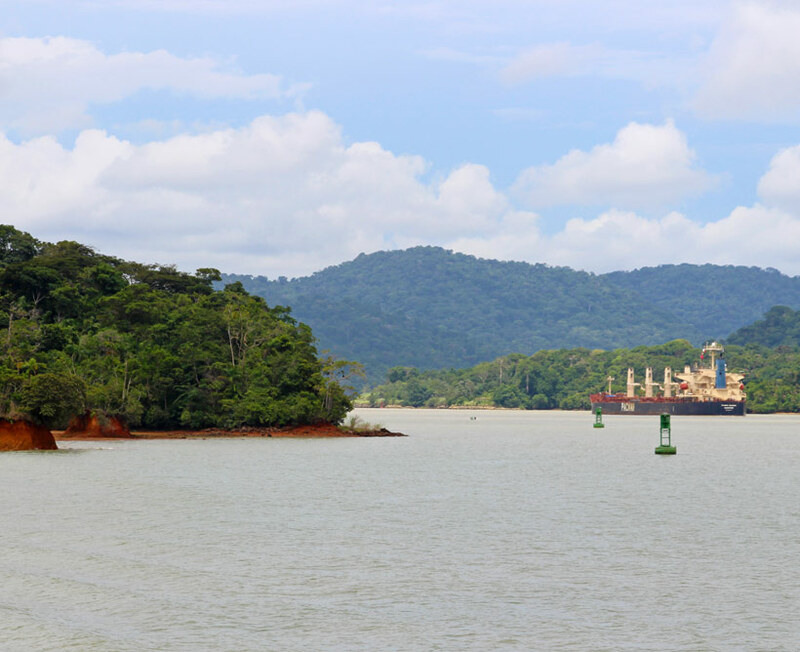 Lake Gatun was the largest manmade lake in the world until the construction of the Hoover Dam. 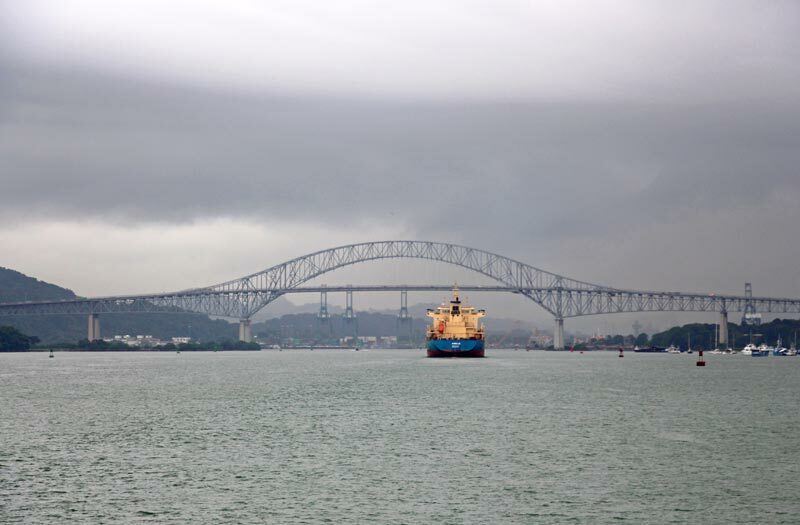 The lake was built as part of the Panama Canal’s construction; it didn’t exist before 1904. 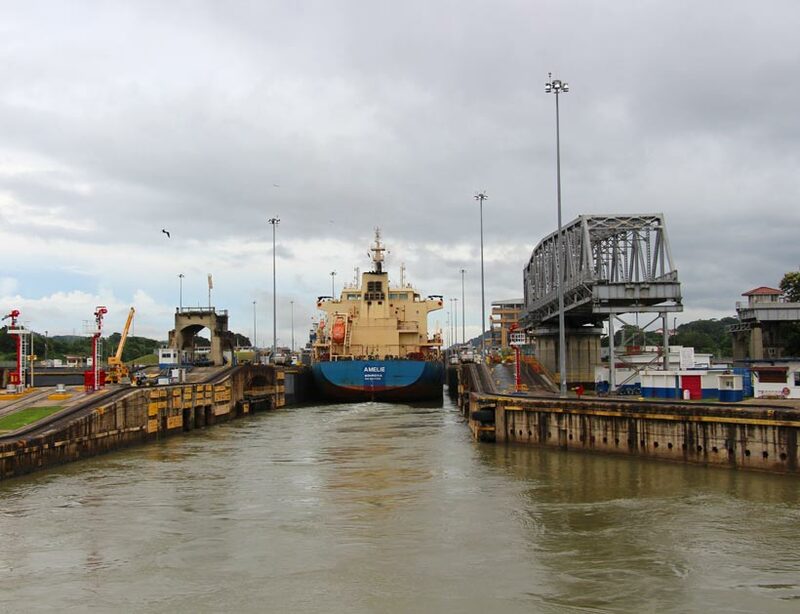 Every time a lock opens, 26 million gallons of water rush out of Lake Gatun. 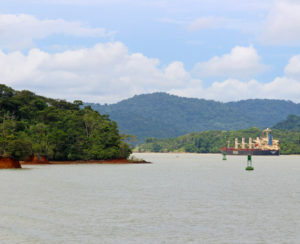 Lake Gatun is a freshwater lake that is refreshed only by rainwater; however, since Panama gets as much as 16 feet of rain in a given year, keeping the lake full has never been a concern. 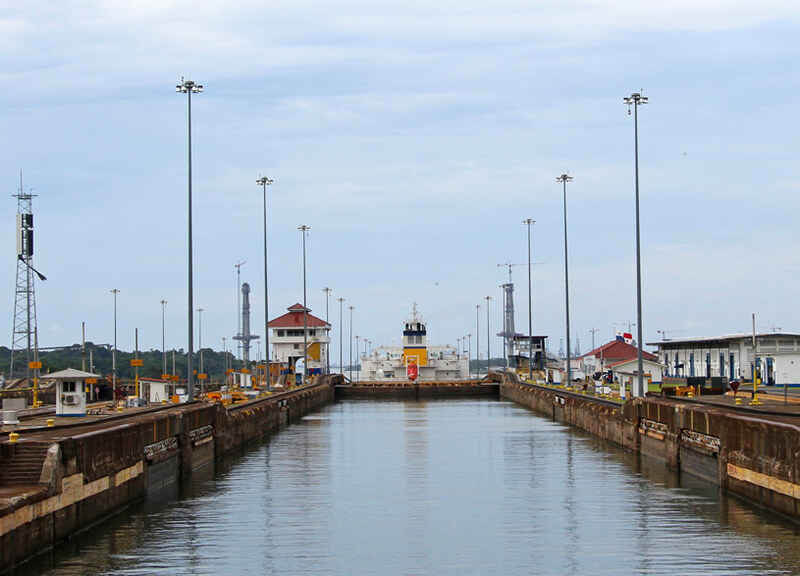 When the locks open, Lake Gatun’s fresh water meets the salt water from the ocean. This causes chaos for the fish who live in the lake, and those fish caught in the lock often die or are stunned by the change in water. That’s why you’ll see tons of birds circling overhead around the locks—as our guide explained, they remember where to find a good sushi buffet! Tolls to take the Panama Canal range based on a ship’s weight, and they can be expensive—to date, at least one ship has paid more than a $1 million toll to transit. Why do shipping companies pay such fees? 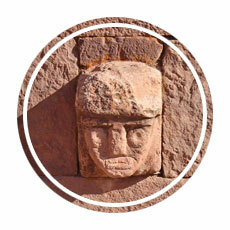 The alternative is to sail down around South America, which adds 16 days of travel. 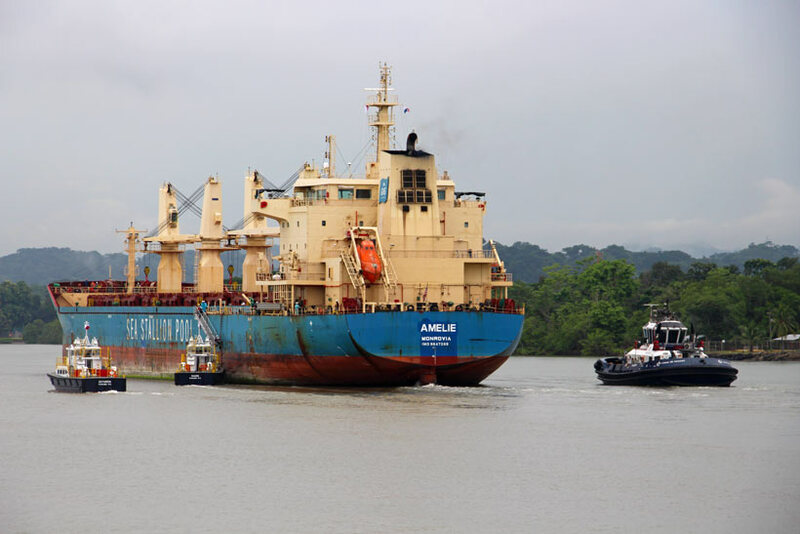 Knowing that a ship can easily burn $100,000 in fuel each day it is at sea, combined with other operational costs and crew-related costs, the Panama Canal actually saves money in addition to more than two weeks of time. While Panamax ships were once the largest that the canal’s locks could accommodate, two new locks opened last year that are much larger. 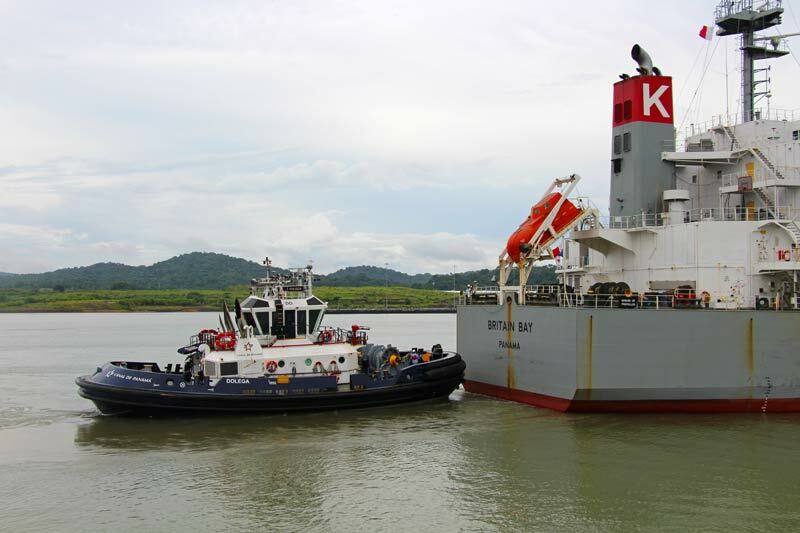 Now, “post-Panamx” ships are able to pass through safely. Adam and I flew to Panama specifically to see the Panama Canal, and it was worth every second of our journey! Seeing the locks operate from our front row seats was an incredible educational experience, and its one we wouldn’t mind repeating again in the future. If you’re planning a visit to the canal, you have a few options available to you. The most inclusive—and most expensive—option is to take a full day, full transit cruise along the canal. That was the option we chose; we spent more than 10 hours on the water, and the only thing separating us on the boat from the locks themselves was a railing. If you don’t feel the need to see all three locks but still want the experience of transiting through one, partial transit cruises are in great supply and run almost daily through several operators. 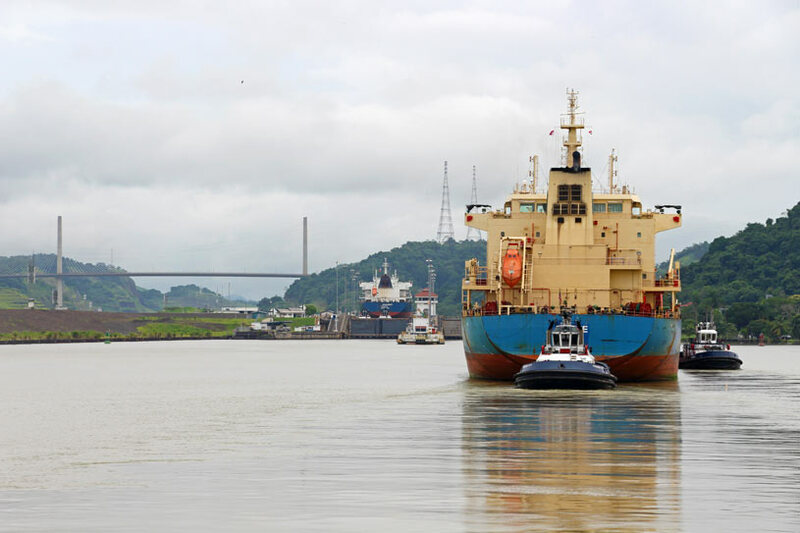 If you want to avoid sailing entirely, there is a great museum and viewing deck at the Miraflores Locks; you can book a round-trip tour from Panama City, or you can take public transportation (a combination of the metro and a bus) and enjoy the day at your own pace. You’ll need at least 30 minutes on the Panama Canal viewing deck, which looked packed from where we stood on the boat, in order to see a complete transit. Is it worth it to invest an entire day of your vacation in visiting the Panama Canal? We absolutely think it is! The tour we booked filled our boat with both full transit and partial transit passengers, so while the boat was pretty crowded in the morning we enjoyed a lot of breathing room and great viewing spots during the second half of our day. 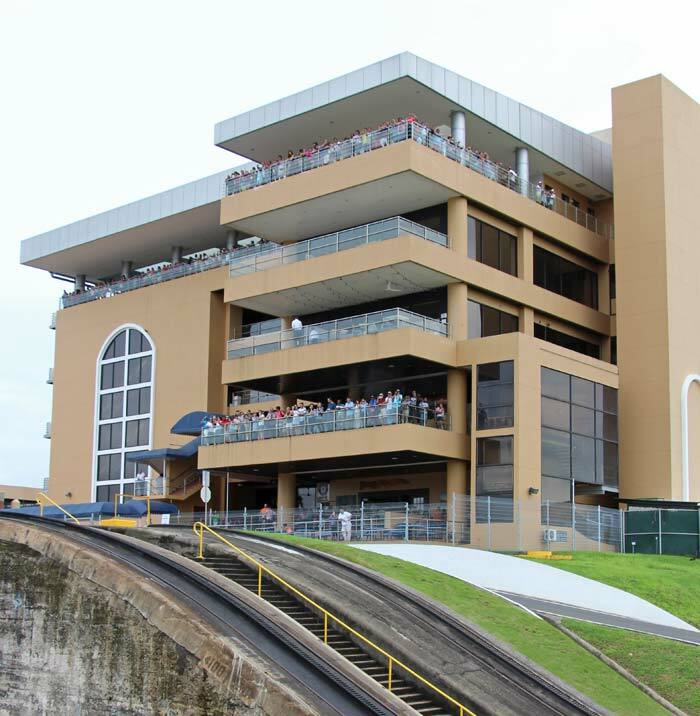 We also loved the experience of our ship being raised and lowered by the locks; partial transit passengers only experience one of the two options since they disembark at Lake Gatun, the highest point of the canal. Even though the best part of the experience was transiting through the locks, the gorgeous scenery that connects the locks is worth the price of the trip. We saw monkeys playing in trees, countless species of birds, and some breathtaking landscapes as we glided along the water. It’s hard to complain about a day like that! If you do take a transit cruise, remember that you’ll spend most of your day outside, even if your ship has an air-conditioned indoor deck like ours did. 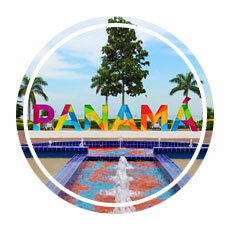 Remember to bring—and apply—sunscreen; you can burn even through the gray clouds that often cover Panama’s skies. We visited during the rainy season, and we brought raincoats and umbrellas on the ship, but we didn’t use them. We had a good 20-minute downpour early in the day, but that was the last we saw of the rain. Still, we were glad to be prepared in case we weren’t that lucky. Finally, get to the ship early to secure a great seat—and be prepared to stay in one place for much of the day if you want to keep it. There is no assigned seating on cruise ships, so if you want a great spot to see the locks, be prepared to find and keep your spot from the first minutes you step onto the boat. We were thrilled to get to the front of the upper deck for some awesome pictures and videos, and seeing the locks open right in front of us truly made the trip special. 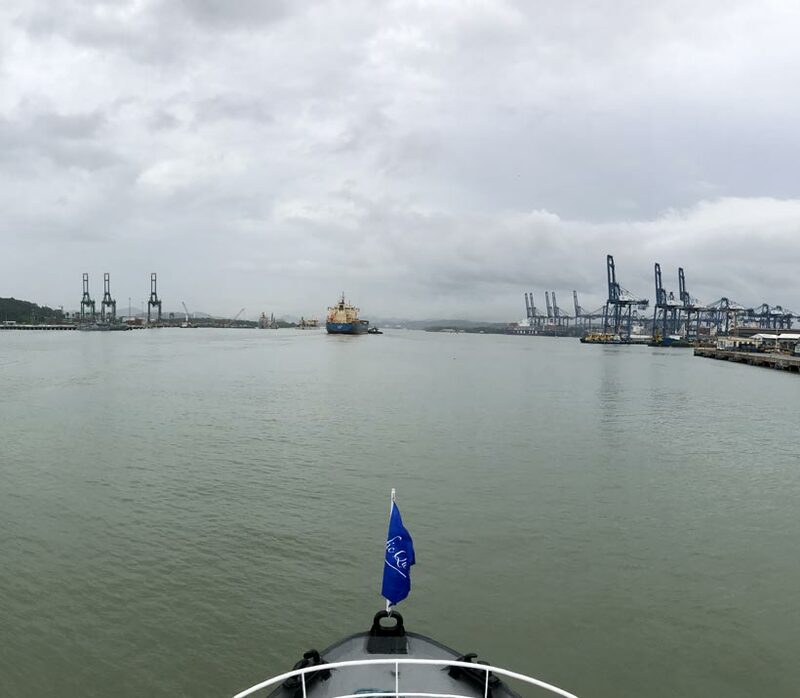 Our visit to the Panama Canal exceeded our expectations and fulfilled a major travel goal of ours. We loved seeing the canal in action, operating exactly as it did when it first opened more than a century ago. 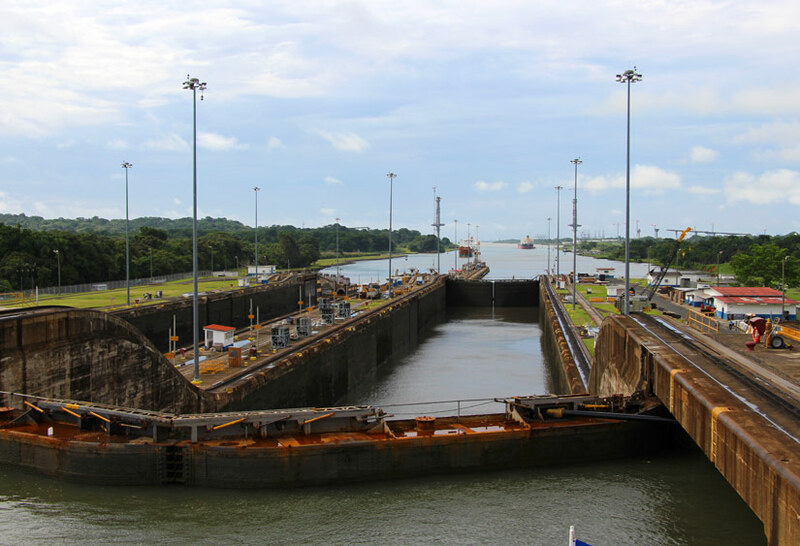 Don’t let a visit to Panama City pass you by without visiting—or transiting—the Panama Canal! 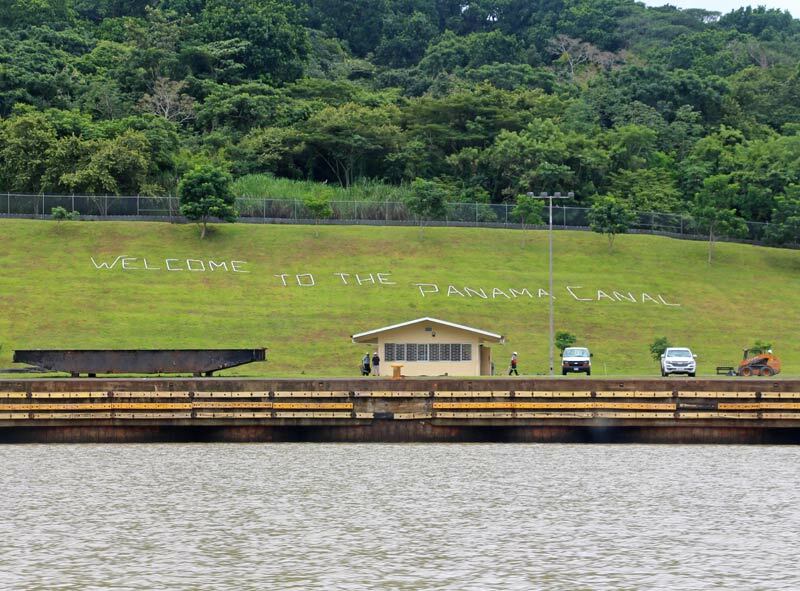 Welcome to the Panama Canal! 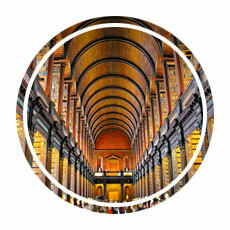 Get inspired for another vacation by checking out a few more of our favorite stories!